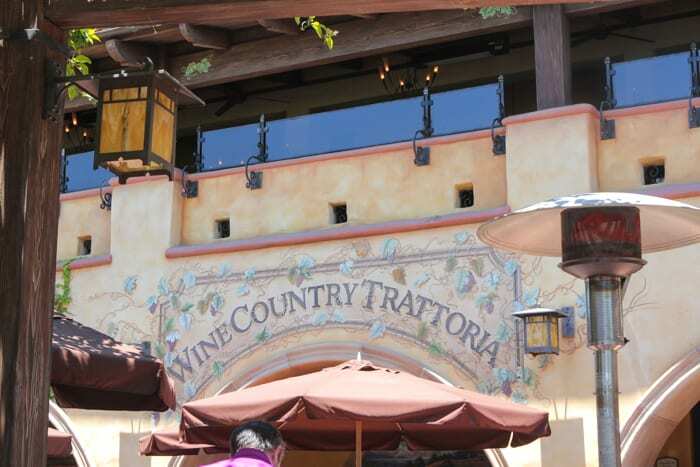 Wine Country Trattoria is located in the center of Disney’s California Adventure in Pacific Wharf and most likely you walk pass and hardly realize it’s there. 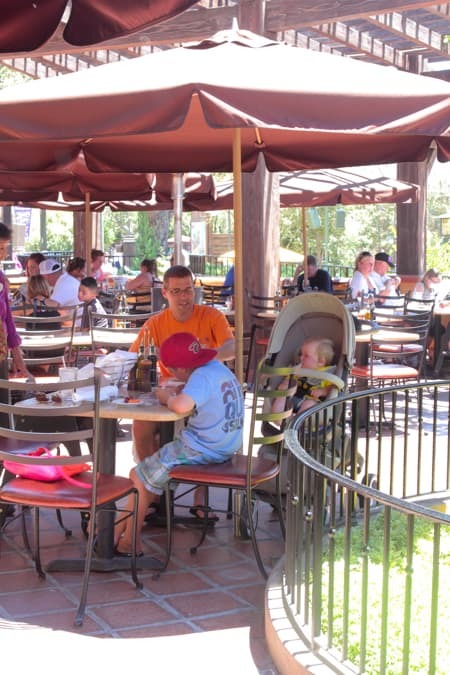 This is a “nicer” dining experience in California Adventure–worth a try if you are asking us. You might be reeled in by The World of Color deal they have, the wonderful Lasagna, or the herb enhanced pizza. 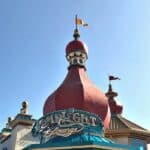 Let’s face it, World of Color is popular and can be difficult to find good seats. 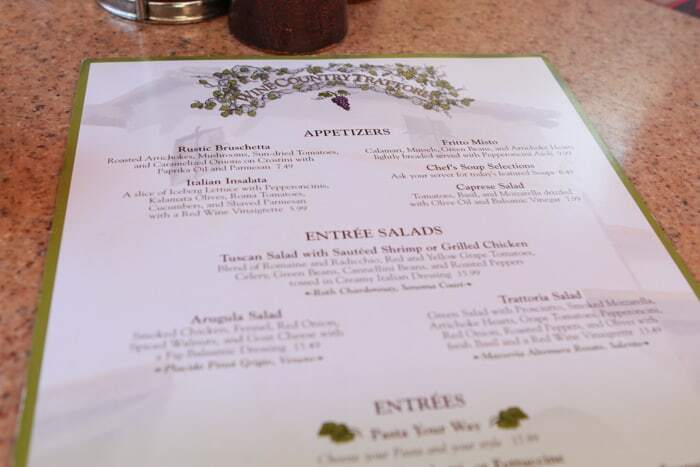 Wine Country Trattoria’s “lunch/dinner and a movie” package costs $29.99 per person for the Italian themed lunch coupled with World of Color tickets with designated seats. 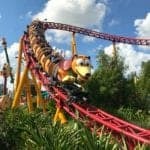 $18.99 is the price for kids 3 to 9. For dinner, the price goes to $41.99 for a 3 course meal, while the children’s price moderately jumps to $21.99. 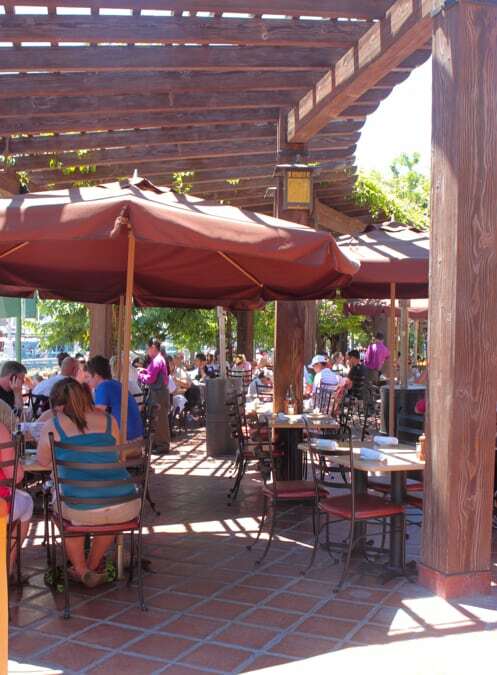 During our Wine Country Trattoria review, we visited on a warm 80+ degree summer day in June. We were on the warmer side, but enjoyed our lunch under a large shady umbrella. A view of the main outside dining area. 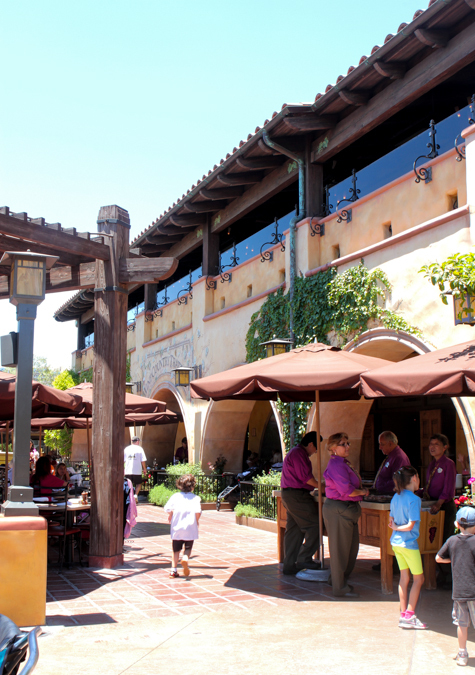 We enjoyed the Tuscan Style design of the restaurant. The boys anxiously awaiting our meal. 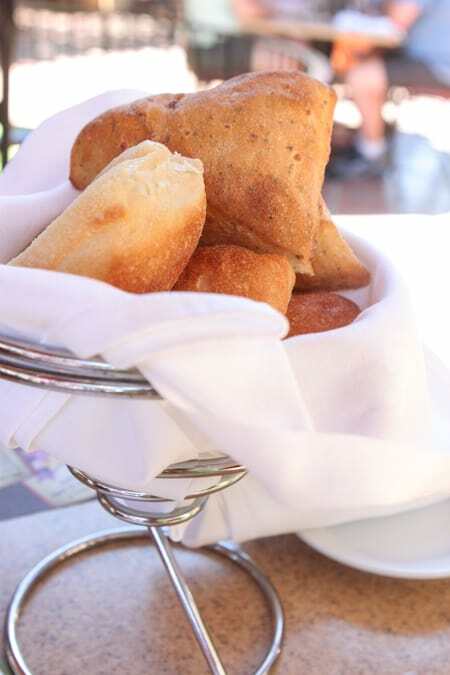 Here’s a shot of the bread that’s brought to each table. A little on the dry side, but swirl it around in olive oil and balsamic to help. 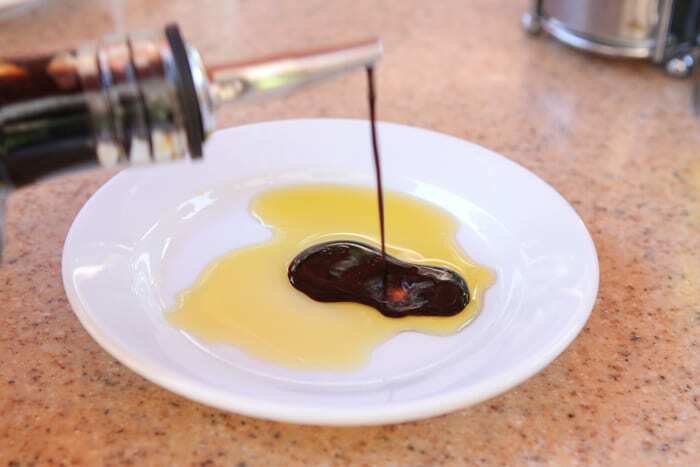 Olive oil and balsamic sits on each table. A little shot of the menu. Minus the cheese, this was an excellent appetizer. 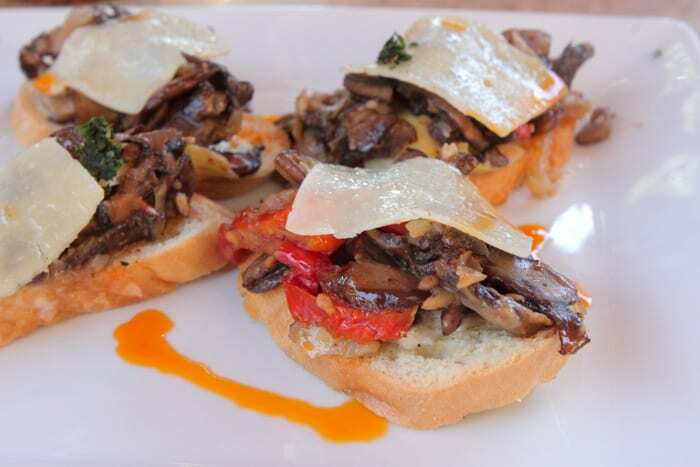 A wonderful mouthful of mushrooms, onions and sun-dried tomatoes. 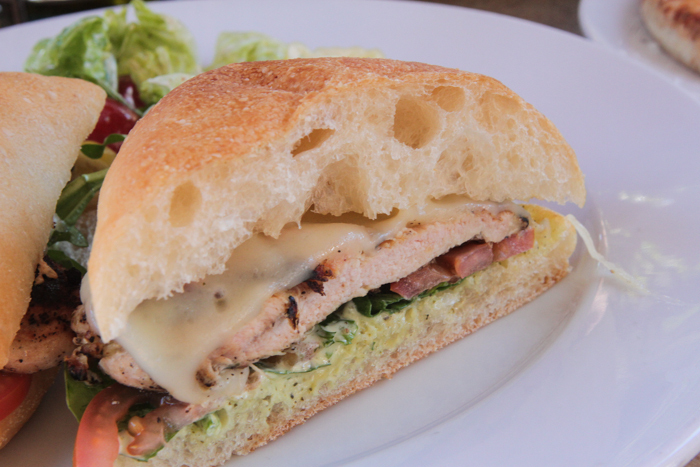 The plus of this Grilled Chicken Sandwich is the chicken. I thoroughly enjoyed the juicy herbed-flavored chicken without the bun. The Ciabatta was not our favorite. Cullen here – Jenny use to get after me all the time for ordering pizza at every italian restaurant. 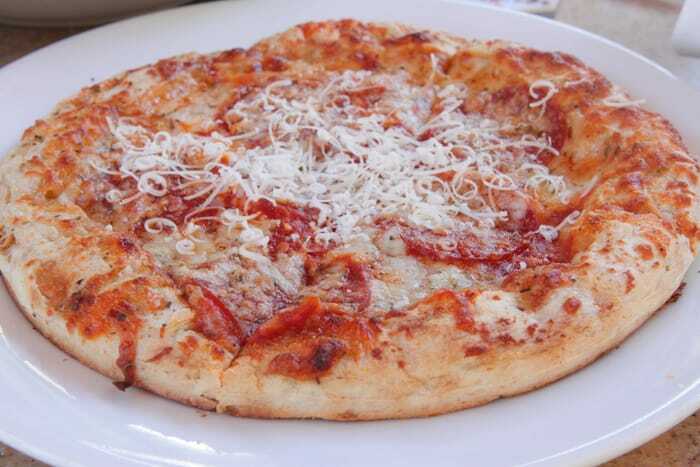 Since moving to California, I’ve moved on from that phase–even though pizza is still one of my favorites. So, I was pleased when I bit into this pizza as it was just right. It’s a simple pizza on a focaccia dough. It had the most pleasant amount of cheese and sauce. And that focaccia….Yum, give me a second pie please! 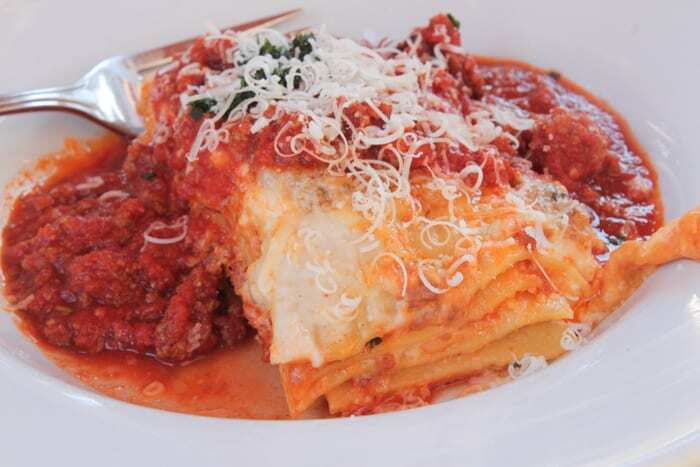 We recommend the lasagna. Great dish, great tasting, great meat sauce. 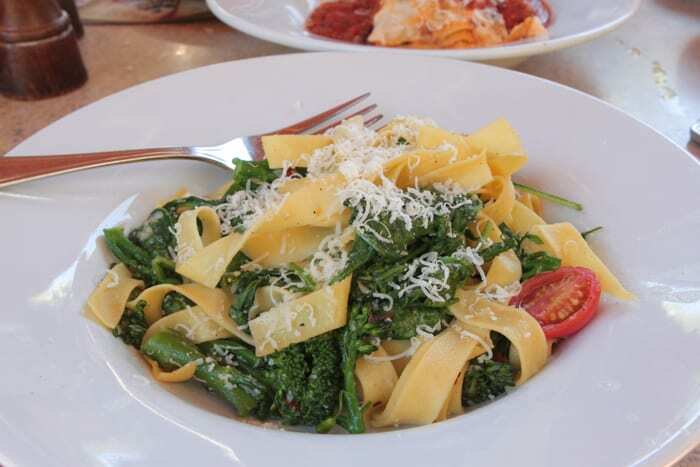 For a lighter dish, the Broccolini Aglio Olio (with Fettuccine) is a must. 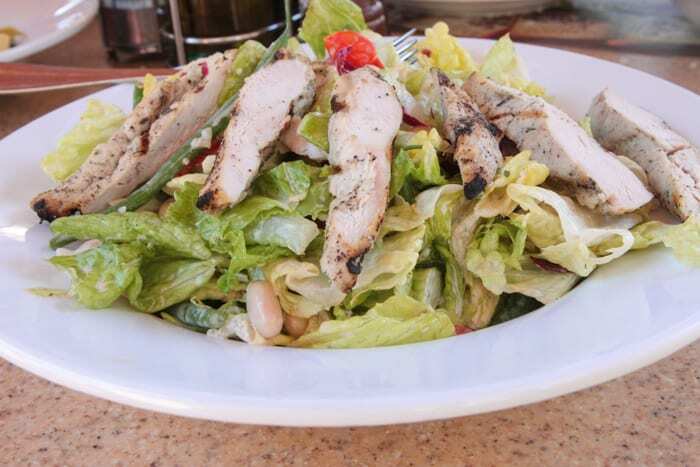 Please pass on the salad. The chicken was great, the rest was not. We give the Wine Country Trattoria 4 STARS because of the Pizza, Lasagna, and Brocolini Aglio Olio. Last thing – we’re sorry but you’ll have to try the wine yourself as we are not alcohol drinkers. I just went there for dinner a few nights ago. It was a big group of us and we ordered almost everything on the World of Color menu. 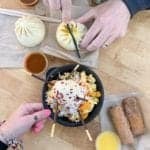 We LOVED it all. I am a lamb purist and rarely enjoy it in restaurants, but the lamb shank here was HUGE and absolutely fantastic. I also tried the Filet mignon which was cooked perfectly and served with fantastic roasted potatoes. 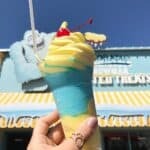 You would LOVE the dessert as well! They served I believe 6 different items to each person, so you had the chance to have everything! Aimee, thanks for sharing….we love to hear these stories. We’ll be trying the mignon, lamb and desserts next time!! California is the world’s best city for tasting wine. California Napa Valley is the 2nd largest city for making wine. Yes, i know the Trattoria hotels. you also said right here is wine available at cheap rates….